Superior quality shiplap building. Ideal for people who want to laze away in their garden building. Supplied with standard floor bearers, tanalised floor bearers can be purchased as an optional extra. Constructed using sturdy 50mm x 50mm frames and 12mm tongue and groove pre treated cladding. Sheds are pre-treated with a Golden Brown Protek water based treatment. FREE DELIVERY AND ERECTION within a 200 mile radius. Our high quality shiplap lodge garden summer houses are available in a range of sizes from 8ft by 6ft up to 12ft by 10ft and all have a 2ft canopy. Our shiplap summer houses are ideal for those who want a standard garden building. Our shiplap lodges include some or all of the following key features; 2 fixed front doors, 2 side opening windows, a pre-treated wood floor, heavy duty ironmongery, tongue & groove roof sections, 40kg green mineral felt. In addition our shiplap summer houses come with standard floor bearers. These garden summer houses are build using 50mm x 50mm frames and 22mm pressure treated loglap tongue & groove cladding. 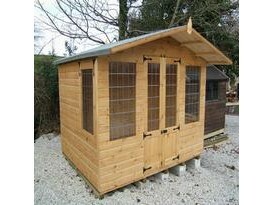 All the Himley Garden Building shiplap lodge summer houses can be fitted with 4mm toughened glass windows. Standard floor bearers can be upgraded to tanalised bearers. Himley Garden Building summer houses can be pre-treated with a golden brown Protek treatment if required.